skillfully varied his matter and style. The community was provided with a sense of mission every time a spokesman stood forth and praised the deeds of exemplary heroes and traced the origins of the tribe. Throughout old English heroic poetry, boasting is associated consistently with the best and most noble parts of life. 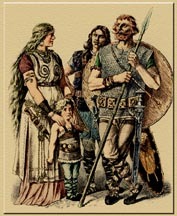 Some critics have interpreted the boasts by Beowulf as evidence of his excessive pride, but his boasts actually serve to illustrate cultural not individual pride. Boasts were taken seriously. Boasts were understood to be serious utterances with personal, social, legal, and political consequences. 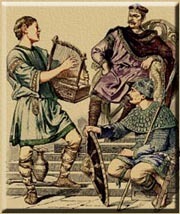 Recent analyses of Anglo-Saxon boasting emphasize its function as pledge. The assembly that would applaud the boast performance is the same group whose members would degrade and ostracize if the boaster did not honor his words with matching deeds. The performance of the scop and the boasting of warriors are both linked with the mead-hall. To appreciate the significance of the mead-hall, we must push from our minds the Mediterranean view built into Judeo-Christian beliefs that drinking establishments are places of leisure and sloth. 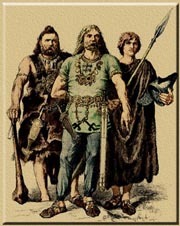 Within the mead-halls of Teutonic civilizations, contracts covering every type of life situation from wars to marriages to property disputes were negotiated and settled. In drink, the Saxon was at peace and vulnerable, therefore at his most civilized. In other words, a sojourn in the mead hall was the original "power lunch." The performance of the scop did not take place in a setting of leisurely people trying to escape the business of life, but among people transacting the business of life. These boasts were not the courtly gestures they latter degenerated into at the Burgundian Feast of the Pheasant and other such events. Like other things that took place in the mead-hall, the boast was a contract -- seriously made; to be seriously kept. The scop was a powerful and important man because he boasted not for himself, but for the entire tribe. Copyright � 2003 by University of North Texas. All rights reserved.